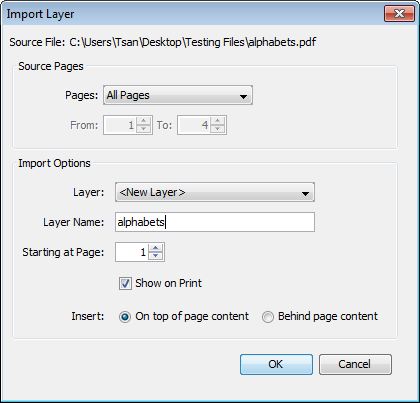 Q: How can I import a PDF document as a layer in PDF Studio? A: PDF Studio allows you to import a separate PDF as a new layer into an existing PDF. This is useful if you want to merge or overlay several PDF documents on top of one another. Access the layers pane by clicking the Layers button on the left side of the screen. If the document does not contain any layers, you will need to open the layers pane by going to View > Tabs > Layers on the menu. Show on Print – Whether or not the layer will be displayed when the document is printed.